Americans are beginning to forget the important origins of our national Thanksgiving holiday. Its spiritual significance is no longer taught in our nation’s public schools. In fact, most school children today are taught that Thanksgiving originated when the Pilgrims invited their Indian friends to dinner to thank them for providing sustenance after the Mayflower landed. As with much of modern American revisionist history, there really is much more to the story. The Atlantic crossing in the fall of 1620 had been an extremely difficult journey for the Pilgrims. For two months, 102 people were wedged into what was called the “tween decks” of the Mayflower-the ship’s cargo space with only about five-and-a-half feet of headroom. No one was allowed above deck because of the terrible storms. This was no pleasure trip. The Pilgrims comforted themselves on their journey by singing from the Book of Psalms. This “noise” irritated one of the ship’s paid crewmembers. He told the Pilgrims he was looking forward to throwing their corpses overboard after they succumbed to the routine illnesses common on such voyages. As it turned out, this crewmember himself was the only person to die on the voyage and be thrown overboard. God providentially protected His own people. A little-known fact about the Mayflower is that this ship normally carried a cargo of wine; and the wine spillage from previous voyages had soaked the beams, acting as a disinfectant to prevent the spread of disease. During one terrible storm, the main beam of the mast cracked. Death was certain if this beam could not be repaired. At that moment, the whole Pilgrim adventure could very easily have ended on the bottom of the Atlantic Ocean. Providentially, the Pilgrims had with them a large iron printing press screw. That screw repaired the beam, saving the ship and all on board. 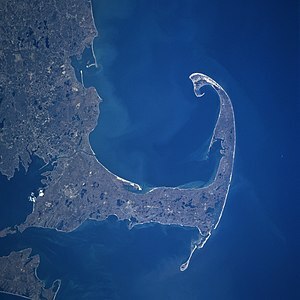 After sixty-six days at sea, land was sighted off Cape Cod, Massachusetts, not the place these Pilgrims wanted to be. They intended to establish their new colony in the northern parts of Virginia (which then extended to the Hudson River in modern-day New York), but two factors interrupted their plans. The winds had blown them off course, yes; but they later learned that other Englishmen who wanted to settle in the same part of Virginia had actually bribed the ship’s crew to land them farther north. Despite this chicanery, God was in charge and the Pilgrims landed exactly where God wanted them to be. Had they actually made landfall near the Hudson River, they most certainly would have been immediately attacked by hostile Indians. Instead, they arrived at the one spot along the coast where hostile Indians had been providentially removed from the land. Many years before the Mayflower journey, local Indians had captured a Frenchman on a fishing expedition to that region. Just as they were about to kill him, the Frenchman warned them God would be angry, would destroy them all, and would replace them with another nation. The Indians boastfully replied that his God could never kill them. Yet, a year or two before the Pilgrims arrived in this very same region, nearly all the native inhabitants had been wiped out by a plague. Despite this miraculous provision of safety from hostile Indians, the Pilgrims barely survived their first winter on the Cape. Only four families remained intact; but God was still faithful. In the spring of 1621, He sent Squanto, an English-speaking Indian who offered to teach the Pilgrims how to survive in this strange new land. Squanto was one of only a few local Indians who escaped the plague. He had been captured as a young man and taken to England as a slave. During that time he mastered the English language. When he was freed, he returned to his native territory on the Cape shortly before the Pilgrims arrived. taught the Pilgrims was how to plant the native winter staple crop-corn. The Pilgrims thanked God for this wonderful helper. They also repaid Squanto by sharing with him the most valuable treasure they had brought with them from England-the Gospel. Squanto died a year or two after coming to the aid of the Pilgrims, but before his death he asked them to pray with him that he might go to be with their God in Heaven. Squanto introduced other Indians to the Pilgrims, and these Indians were also impressed with the Pilgrims’ God. During the summer of 1621, it appeared the year’s corn harvest would not survive a severe drought. The Pilgrims responded by calling for a day of fasting and prayer. By the end of the day, it was raining. The rain saved the corn, which miraculously sprang back to life. 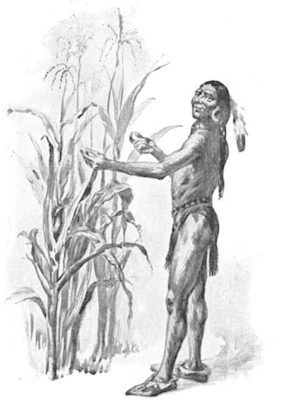 One of the Indians who observed this miracle remarked that the Pilgrims’ God must be a very great God because when the Indians pow-wowed for rain, it always rained so hard that the corn stalks were broken down. They noticed the Pilgrims’ God acted differently by sending a very gentle rain that did not damage the corn harvest. It was that miraculous corn harvest in 1621 that provided grain for the Pilgrims’ first Thanksgiving meal with their Indian friends and helpers. The evidence of history shows that on this first Thanksgiving Day, both the Pilgrims and Indians thanked God for His great provision and for His goodness toward them all. Unlike other Europeans who came to America, these Bible-believing Pilgrims were model Christians in their dealings with the native populations. During their first year on the Cape, Squanto, acting as a friend and interpreter, had assisted the Pilgrims in negotiating an important peace treaty with Chief Massasoit, leader of the nearby Wampanoag Indians. The two populations, Indian and Pilgrim, kept that treaty of peace for more than fifty years. The story of Thanksgiving doesn’t end there. The holiday itself was not officially celebrated until almost 170 years later, after the Revolutionary War had been won and our American Constitution had been adopted. In 1789, Congress approved the Bill of Rights, the first ten amendments to the Constitution. Congress then “recommended a day of public thanksgiving and prayer” to thank God for blessing America. President Washington declared November 26, 1789, as the first national day of prayer and thanksgiving to the Lord. Another 75 years later, after the Civil War ended, President Abraham Lincoln officially established the last Thursday in November as a day to acknowledge “the gracious gifts of the Most High God,” which He had bestowed on America. Every president continued this tradition until 1941 when Congress officially made Thanksgiving a national holiday. Now that you know the true story of Thanksgiving, this year make sure your children and grandchildren learn it too. As America is currently facing serious challenges both at home and abroad, let’s join together with countless generations before us in giving thanks to God for blessing and preserving our nation. Let’s make sure that all our children and grandchildren learn Whose hand of protection has been on America; and let’s all pray that He will continue to bless and sustain our nation as we continue to acknowledge and honor Him.